When Simonsig won the 2013 Arkle Chase in spectacular style, he was among the most popular and exciting horses in training but following a near three year absence the big question remained ahead of his return at the weekend; Was there anything left in tank? Fingers were also being crossed by Camilla Henderson, the daughter of Nicky Henderson, with the horse clearly still held in high regard by all at Seven Barrows. Simsonsig was always an exuberant runner, even in his hey day, and that was the case again as he raced with great enthusiasm on Saturday before being beaten by Bobs Worth after finding very little off the bridle. Social media quickly exploded with views on the returning Simonsig with opinions being thrown around left right and centre by various figures from within the sport as well as racing fans. Brilliant debate going on RE Simonsig's comeback. Personally I thought it was very good, but not sure he'll be winning G1s this season..
A drop back in trip to 2m is now on the cards for Simonsig with the Tingle Creek at Sandown his next aim according to reports. 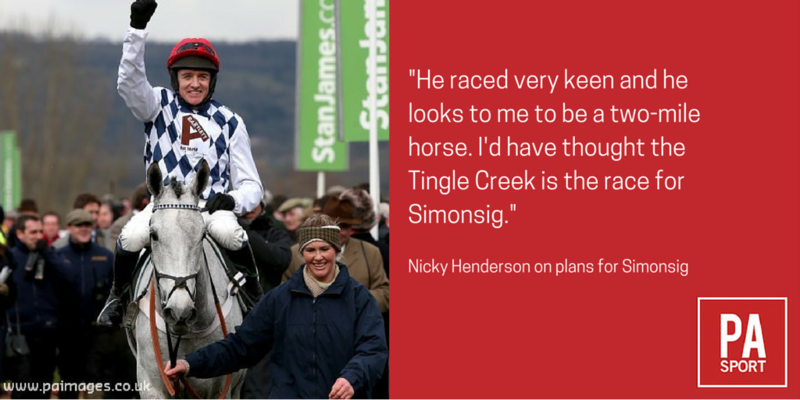 Simonsig will be aimed at the Grade 1 Tingle Creek Chase early next month, that should give us an idea of how much ability he has left. We ran a poll about Simonsig following his return and it seems as though the majority of our followers do still retain faith in the dual Cheltenham Festival winner. It would certainly be fantastic to see him back to his best in the Tingle Creek. Sunday Poll - Will Simonsig be a genuine contender at Grade 1 level this season over fences?